Medallions are a primary indentification motif in rugs from around the world. 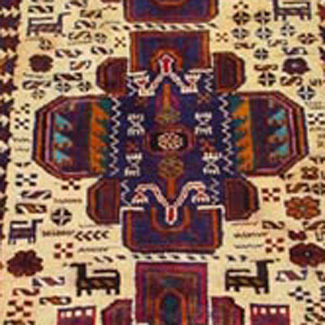 Afghan rugs, particularly Baluchi rugs, have a variety of medallions used by artists in particular regions. Eight lobe Baluchi medallion. Unusual features are light field and bright colors. Borders are like hedges surrounding a garden. Many rugs have three borders, a main border surrounded by minor borders, or guard stripes. Regions, towns, families, and weavers have their own border designs, so borders are a good way to identify and group rugs. The curator of several important war rug exhibitions, Ariel Zeitlin Cooke, finds borders to be a primary identifier of rug origins. 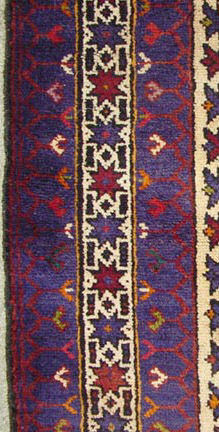 The main, or center, border in this rug is typically Taimini. The white border and eight pointed stars are what make it Taimani. Unusual landscape element as mihrab.